Yesterday, I asked our email subscribers for your top two questions about the poverty spirit, and you answered! Thank you! Below are the first 10 questions. I received MANY more, and I’ll answer more of those tomorrow. 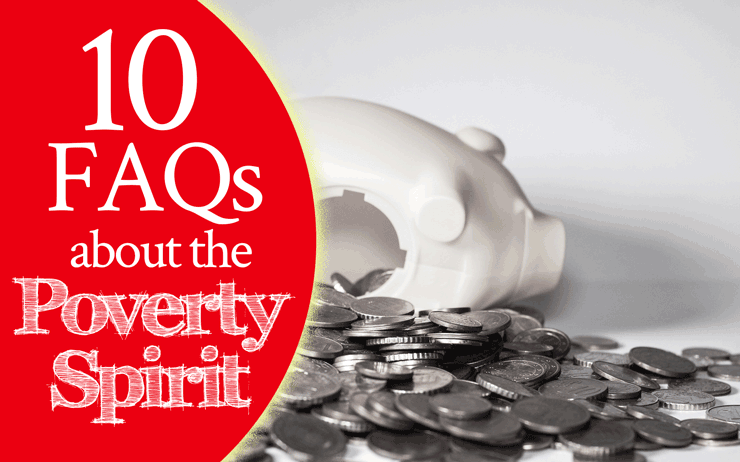 But for now, here are the first 10 FAQs about the poverty spirit. Before you read this, please also read 7 Signs of a Spirit of Poverty, here. 7 Signs of a Spirit of Poverty will tell you what a poverty spirit is–a demon which deceives you and does its best to keep you poor–as well as how it works and what it does. That article will give you the diagnostic tools to determine if a spirit of poverty is operating in your life or not. After reading that article, THEN come back to these FAQs. This conversation about poverty does not address cultural or physical issues, such as the starving children of South Sudan, or starving elderly people who are unable to work, or people who are so severely disabled that they cannot work in any capacity. This conversation DOES, however, address most other situations. Not all, but most. If you read through these FAQs and see something that applies to your own situation, I pray you’d prayerfully take action to improve your situation. 1. Is poverty always the result of a poverty spirit? “Revelation” means you must understand, with full grasp, exactly what God’s Word says about money and every aspect thereof. “Obedience” includes obeying God with the intensity, speed, and energy His Word says we should apply to our obedience. Dave Ramsey calls it “gazelle intense,” and you should read his description here of what “gazelle intense” means, along with the Scriptural basis for it, before you go any further. “Spiritual warfare” means understanding that the enemy ONLY comes to steal, kill, and destroy (John 10:10); learning what his tactics are; closing doors that allow the enemy to access your life; and overcoming him with the proactive tools and methods God has given you in Christ and purchased for you with Christ’s blood. If you get one of these three aspects right, but are missing any of the others, you will still be poor. You might have great revelation, but no obedience–and you’ll still be poor. You might have great obedience, but no knowledge of spiritual warfare–and you’ll still be poor. You might be obeying God some, but you’re taking your sweet time–in other words, obeying without the intensity and focus God prescribes in Scripture–and you’ll still be poor. You might have tons of knowledge of spiritual warfare, but no revelation and therefore no obedience–and you’ll be even poorer. You must have all three factors aligned with God’s Word and completely present in your life in order to walk in prosperity. Also, note that walking in prosperity is a JOURNEY–and it can be a long one. It’s a marathon, not a sprint. It takes time. The best time to start that journey was 10 years ago. But, if you didn’t start 10 years ago, the next best time is today. Right now. Just start today, and in one year, five years, ten years, and thirty years, your life will be unrecognizable compared to where it was right now or the prior year. 2. How do you get a poverty spirit? By disobeying God, whether by accident or on purpose … even if we do so unknowingly! If you have given your life to Jesus Christ and made Him the Lord and Boss of your life, the enemy has no access to put his hands on your life–unless you give him that right. And how do you give him that right? By disobeying God. … which is to steal, kill, and destroy. In that case, we’re disobeying God, because God says not to be conformed to this world, but to be TRANSFORMED by the renewing of your mind, that you may prove God’s good and acceptable and perfect will in your life (Romans 12:2). We have to be studying God’s Word and getting revelation from it in order to be obeying God. If we’re not, we’re opening a door to the enemy AND we will easily fall for the enemy’s lies. Well, you’re disobeying God, because God says that whatever your hand finds to do, you should do it with all your might–and that he who will not work should not eat. God says to work. Well, that’s definitely an open door. Whether you’re co-signing a loan, going into debt, or not doing business, disobeying God creates problems in our lives. The problem is, most people think God has very little to say about money–but actually His Word contains VERY comprehensive information about what to do and what not to do regarding money. God’s Word contains specific instructions for investments, spending, giving, doing business, taking care of your family, and more. If we aren’t doing any of those things THE WAY GOD SAYS TO DO THEM, we’re disobeying God … and allowing the enemy to oppress us, both through the poverty spirit and through any other evil minions he chooses to send. Basically, God’s Word calls for radical obedience with ALL the intensity of which are capable. Anything less opens doors to the devil in your life. There is no middle ground. Are you still with me? I hope so, because this is truth that will change your life. THIS is what it takes to be a real disciple of Jesus. 3. Do I have to tithe in order to prosper? Answer: Yes. Yes, you do. If you don’t believe in tithing yet, but you’re willing to learn–in other words, you value God’s Word over your own pride and materialism–then please read my article here, entitled The Sixfold Blessing of the Tithe, to learn why tithing is NOT, in fact, an invention of the Law. If you don’t believe in tithing and aren’t willing to learn, then enjoy your poverty. And don’t bother reading further; the rest of this article will not help you. Sorry. Giving the Lord His tithe back is the only way in Scripture to get the devourer–Satan–off of your life, money, and stuff. The tithe is better than any insurance policy. If you want to keep the devil from devouring your stuff, then tithe. 4. I tithe, but I don’t see the results God promises from the tithe. How can I get better results? Pray over your tithe. BE SURE to pray this sixfold blessing of the tithe, every time you give your tithe. Ask God to show you how He is answering your prayers over the tithe. Ask Him to show you the occasions in which He rebukes the devourer for your sake. When I started praying over my tithe, I started getting new, incredible, and obvious results. Also, I started seeing occasions in which the enemy was trying to steal, kill, and destroy–but God was rebuking it off us. Crazy things, like the enemy’s attempts to pull us into car accidents, sicknesses, people trying to steal from us (but not being able to), injustices rebuked, etc. Every time I see something bad looming on the horizon, I pray the sixfold blessing of the tithe … and it works, every time. Remember that the heaven and the heaven of heavens belong to God, but the earth He has given to children of men (Psalm 115:16). God owns the earth, but He has delegated authority on the earth to us. So, if you want to see Him move in your life in ANY area, you have to pray for that area and for the particular move of God that you want. 5. How can I get a better harvest from my offerings and seed givings, above the tithe? That one book will revolutionize your life. Also, be sure to name your seed. To do this, write out your check and speak to it before you give it. For example, let’s say you write a special offering check to your church for $100. Hold that check in front of your face after you’ve written it, and talk to it as if it were a person. Tell your seed what it is and what to come up as. Also, be sure you’re sowing into good ground. I have sown into good ground and not-so-good-ground at various times in my life. I can tell you for sure that the seeds sown into good ground got a MUCH bigger harvest than the seeds sown into the sickly ground. What is the fruit of this place? Is Holy Spirit in charge here? Or, is something or someone else in charge here? In what spirit do the leaders of this place operate? Is this organization obeying God? The ground you sow into can make a big difference in the harvest you receive. Recognize as well that there is seed, TIME, and then harvest. Some types of seeds can come up overnight, but other types of seeds come up after decades. This is true in the natural world, as well as in the spiritual. Because not all seeds grow quickly, keep a record of your seeds and keep praying over them–even if it takes years to see them come up. Related: Take the 2018 Abundance Challenge, and watch the Facebook video on which I’m teaching about Harvestology, here. 6. I tithe and offer to the Lord, but my husband does not. How should I pray over our finances? The Lord knows your situation. Keep on tithing and offering. While you’re at it, pray aggressively over your family’s finances just as you would if your husband were tithing and offering to the Lord. Pray that the Lord would encounter your husband with His goodness, which leads men to repentance. Being willing to tithe and offer to the Lord requires a heart of submission to Jesus. Pray for the root cause–your husband’s need to surrender Lordship of every part of his life to Jesus–not just for the symptom (the lack of tithing). 7. How can I stop feeling envious of how other people are spending money and enjoying their lives? First, repent. Second, renew your mind in truth. I say “repent” first because envy is a sin. Bob Sorge calls it “the biggest sin nobody has,” and it’s a demonstration of disrespect toward Holy Spirit. Because envy is sin, we have to handle it in our lives the same way we would if Holy Spirit convicted us of pride, fornication, gluttony, lying, or any other sin. We get right with God by repenting–confessing our sins to the Lord, receiving His forgiveness, and turning and going the other way. After repenting, you have to renew your mind in truth. The truth is multi-faceted. It involves renewing our minds with God’s Word so we can gain revelation about what God has for us and what He expects us to do to receive those things. It also involves learning to be content and happy while we pursue those promises. God’s Word says we should chase after all that God has for us, while ALSO being happy/content even if we’re not there yet. Contentment doesn’t mean we don’t chase after more. It means we can still be filled with joy and the fruit of the Spirit, rejoicing always and trusting God, even along the journey. It also helps to educate yourself about personal finance and the real state of the people around you. The sad truth is that most people who are spending a lot of money aren’t rich; they are just deeply in debt. “Keeping up with the Joneses” will take you right down the path to bankruptcy, and the sad thing is that you’ll probably meet those very Joneses in bankruptcy court. Learning these very practical things about personal finance will remove a lot of the appeal from the way other people live. You also have to have received inner healing from the Lord if you want it to be easy to avoid envy. People who spend money left and right are often trying to gain acceptance through the appearance of wealth. They are desperately trying to “be somebody” so they can overcome lifetimes of rejection and abandonment. If you haven’t received inner healing yourself, then you’ll look at those people and find their lifestyle attractive. You’ll often feel that you need to compete in their sorrowful race. You’ll feel that you need to measure up to their standard in order to “be somebody,” just like THEY are trying to measure up to someone else’s standard in order to be somebody. However, if you have been healed by the Lord from all your past hurts and wounds, then you will be able to look at them, bless them, smile, and go your way. You’ll know who you are, and you won’t have to measure up to someone else’s standard in order to be happy and fulfilled. Running in your own lane will give you joy if you’re healed on the inside. If you aren’t, though, you’ll forever be trying to measure up, and success will always be elusive. 8. We don’t set aside any offerings to the Lord or for charity. Is this keeping us from receiving more? Give, and it will be given to you: good measure, pressed down, shaken together, and running over will be put into your bosom. For with the same measure that you use, it will be measured back to you” (Luke 6:38). God’s Kingdom is a Kingdom of generosity … and generosity flows like a river. If you are not in the flow, you won’t benefit from the flow. It’s as simple as that. On the other hand, if you jump into the flow of generosity–the great circle of giving–then you will receive. As you give out, more will be pressed into your bosom. You can’t out-give God. He will always give back to you when you give. Additionally, God’s Word commands us to give both tithes AND offerings. 9. How can I overcome the feelings that we can never go anywhere or do anything because we don’t have enough money? That depends on your situation. Is it the lack of money that hinders you? Or, is it the feeling of the lack of money? I’ll address both. If it’s the feeling of the lack of money, that often stems from not thinking you deserve enough. The Lord dealt with me awhile back about this, giving me one of the most healing prophetic words that I’ve ever received. You can check out that word here, in You Don’t Think You Deserve Enough. Those feelings can also stem from fear. If you’re afraid of lack, then you might not want to spend money or be willing to do so–even when you’d love to go on that nice vacation or give the kids a nice gift–and even when you do, in fact, have the money. If fear is the issue, read about how to get healed from fear here. Also, know that fear is a father issue. If you struggle with fear and have hurts and wounds inflicted by father-like figures in your past, I have a video class about how to get healed from father issues. I currently can provide that via email, as I have not gotten it uploaded on my Gumroad store yet. If you want a copy of that video class, email me. The class fee is $25 and can be paid via PayPal. You would look the three areas mentioned above: revelation, obedience, and spiritual warfare. Then you would start at the beginning to diagnose the actual root of the problem. Lack of money is a symptom, not the root problem. To identify the root problem, you would look at the practical areas of obedience, work, business, budgeting, savings, spending levels, and more. You would also work hard on gaining revelation about what God says about money in all these areas, while also renouncing the spirit of poverty with all it entails. 10. Is poverty a generational spirit? Then yes, poverty is likely a generational curse in your family. However, if you’re the first person in your family who is poor, it can also be something that you let into your own life. Finding Deep Soul Healing 102. The 101 class will help you close doors to the enemy in your life. The 102 class is about breaking curses and generational issues. You have to go through the 101 class in order for the material in the 102 class to work. I have many more questions about the poverty spirit that you all have sent in, but I’ll address more tomorrow. Please stay tuned! In the meantime, is the Lord dealing with you about one or more of the things we discussed above? Please leave a comment below if so! I’d love to hear what Father is saying! I saw one of my questions being answered, which is question #10 regarding “Is poverty a generational spirit”. Thank you so much for clearing this up for me and for sharing “Finding Deep Soul Healing 101 & 102”, I am truly grateful!